I’ve a childhood memory of two large teddy bears as the first toys I ever received as presents. They were huge, and I would wrestle them, throw them down the stairs and make them be prisoners of war. I was a disturbed child I think. What happened to these types of toys I wonder? Some must get passed down to other disturbed children in other families, some are destroyed by angry dogs and others just simply get lost. But what happens if they seek you out in your nightmares? Well, if that sounds horrible… welcome to Your Toy. 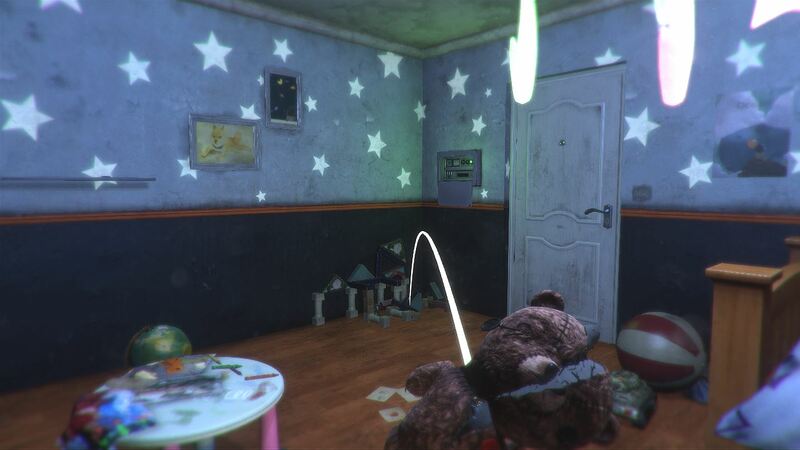 Your Toy is an escape room/horror game. It all takes place via a first person viewpoint, where you start the game waking up in a toilet. This however was a frequent happening for me for most of my 20’s after a big night out, so straight away I felt right at home. You have a number of items like a key and a phone, and it doesn’t take long before you head away to solve problems. But the phone is locked by a password, and if you go to the map section you find you’re in your old school toilets. So what now? Well, that is the crux of things right there, because it’s a tricky game and you will need your brain power to be at full speed ahead in order to get out of this damn toilet. You play Your Toy by walking around and examining your surroundings. You can zoom in so that you can examine items, and there’s the option to ‘use’ things too. There’s also a jump button, but I don’t think I ever needed to use this – and that’s about your lot. You pick up items, checking them for clues or combining them to provide extra equipment. For instance, a piece of wood and a hammer head makes a… hammer. Although that is most definitely one of the simpler solutions to the puzzles found throughout Your Toy. Certain items have strange numbers or symbols on them, like a toilet roll tube that will provide an essential solution way down towards the end of the game. When you make certain items you can use them to get over obstacles, with some very clever escape room designs and puzzles within puzzles all found on top of a deeper puzzle. It’s a very clever game. But what about the horror side of things? 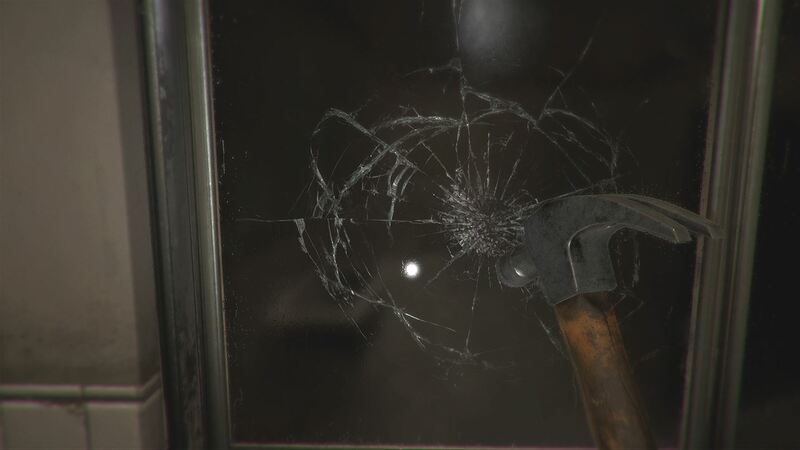 There is something connected with childhood memories and horror that has seen it be a very well used trope in games and films since the beginning of time. Haunted toys and giggling school children are something that I have seen a hundred times before, but for some reason it still scares my socks off. I suppose if it ain’t broke, don’t fix it, and this game creates a very scary first half, with thunder and doors making knocking sounds all by themselves. It’s a very creepy atmosphere that continues all the way through to the reveal of a scary monster and its killing intentions. The second half of Your Toy isn’t as terrifying though, and that’s due to you now knowing what is after you. It’s like seeing the shark in full in the film Jaws, it doesn’t scare as much when you know what it is… a big rubber prop. The story found within it though has some nice touches, with good old fashioned horror tricks used when needed. But it plays out with enough sub-text to make it interesting and intriguing. 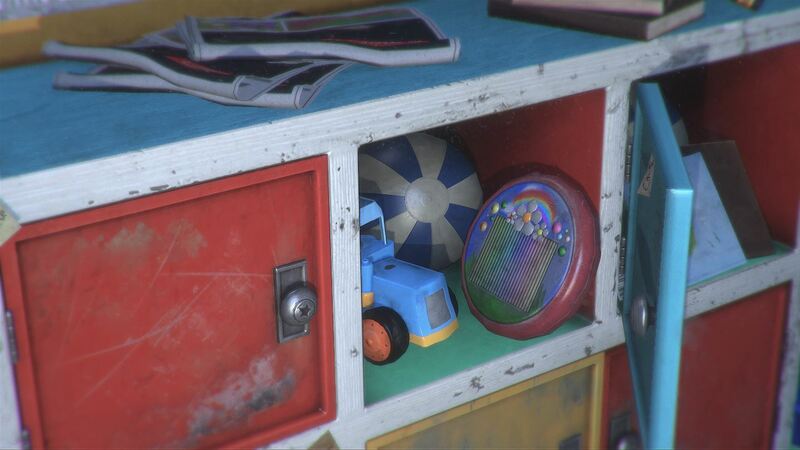 There are some nice jump scares, as well as a mixture of sadness and potency regarding lost childhood toys and memories. It’s a rather short game mind, and depending on how good you are at puzzle solving, will probably find your time with Your Toy over at somewhere between the one and two hour mark. Visually and I’m sure this game has been made with VR in mind, as it would suit this medium very well indeed. But for us mere mortals who have to game with a TV in front of us and a controller in hand, it still comes with a nice visual edge to it, especially those dark and shadowy scenes. Once again when you see everything on show, it gets less interesting and more fake, but I like the design of the main creature and the little jump scares dotted around the game. The sound design is excellent throughout, with some great use of volume and effects. The soundtrack itself is moody and atmospheric, with creepy children noises and horrible ripping effects. Your Toy is a game that I’ve enjoyed a lot. It’s a puzzle/escape room title that is fairy short and delivers nothing original in the story department, but it all works well enough for a couple of hours enjoyment. The puzzles can be very hard at times and you will find yourself reaching out to the magic of the internet more than a few times to get you through the hardest ones. At the end of the day though, if Your Toy does one thing, I now know never to be mean to a toy again… they remember everything.